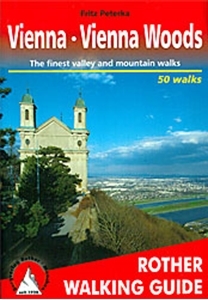 Vienna and Vienna’s Woods in the Rother Walking Guides, is a walking guide to a mix of 50 easy strolls, city walks and well-known and impressive walks, in Vienna and the surrounding areas including north of the Danube and the Vienna’s Woods. All walks are presented with a wealth of information, offering grade of difficulty, a description of the route, a small walking map inset showing stages, height differences and walking times, and when available, a photograph. The topographic maps featured in the pocket guide vary in scale of 1:12,500 and 1:125,000. An additional overview map at the back of the book helps locate the walks. All walks are easily accessible by public transport and pass at least one inn or a Heuriger (wine tavern). They include 7 circular sight-seeing routes to guide you through the major attractions of Vienna, three around-the city hiking trails and two crossing the entire way through the city; thirty walk in the Vienna Woods and the surrounding areas, and 10 in the north of the Danube area.